A-level results day 2018: what to expect - Which? Are you a Scottish student? Read our guide to SQA results day instead. A-level results day this year is Thursday 16 August. Keep yourself calm while waiting your results by getting organised for the big day. Make sure you have all your important details to hand – this will be especially useful if your results are lower than expected and you then need to apply via Clearing. GCSE results – they might come up. Even if you are very confident, it can't hurt to have a plan B in place. Revisit other course options and look at your personal statement again. You could even practise mini-interview situations to prepare for the possibility of a Clearing phone call. Doing this research beforehand will allow you to stay focused on results day. And finally – be kind to yourself and try and get a good night’s sleep! Nerves might make you restless, but do your best to keep calm and not stay awake worrying. 2. What happens on A-level results day? You can collect your results day from your school or college. Contact your school for their exact opening and closing times as this will vary. Ucas receives your results directly and will update Track – this is normally about 8am. The system will be very busy, so you might need to be patient to find out whether you’ve been successful. Universities may also take a while to make their decision and for this to show on Track, so it might be worth contacting them directly over the phone. While you can check Track to find out whether you’ve got into your university, you’ll still need to collect your results to see exactly what you got (especially if you need to enter Clearing). How you go about collecting them is entirely up to you. Decide whether you want to open them alone, with friends at school, or take them home and share the experience with your family. If you can’t collect these in person, let your school know and arrange for someone to collect them for you. As long as you can get online, you’ll still be able to see your results by logging into Track (although going through Clearing is something you’ll need to do, rather than a parent or family member – universities will want to speak to you). Congratulations – the hard work paid off! Once your Ucas Track status updates – this can sometimes take a few hours on busy results day morning – you’ll be sent a confirmation letter in the post from your firm choice. Sit back and start preparing for university. Disappointing, but you may still get an offer from your firm choice. 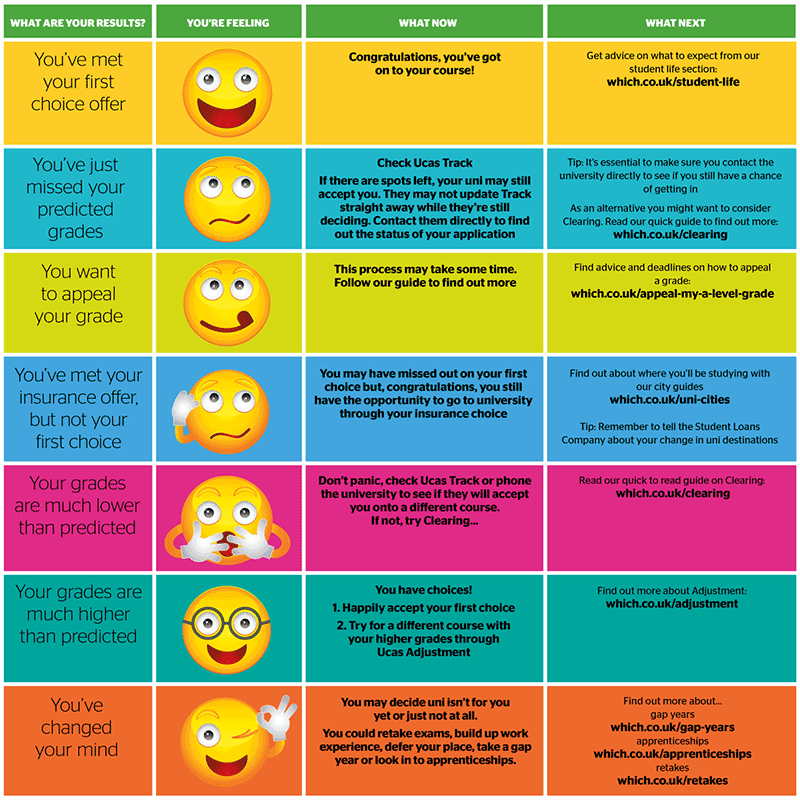 Check Track and see if your status has changed to ‘unconditional’ or if you’ve been offered a place on a different course at the same university. This is known as a ‘changed course offer’, which you’ll need to accept or decline. If you just missed out on your grades by a few marks or intend to appeal any grades, you may be able to ask your firm choice to reconsider if they haven’t accepted you. Speak to an adviser or teacher before doing so. Well done! Once your place is confirmed in Track, you’ll be able to apply for your student accommodation. At some point before you go, you’ll also need to change your student loan details – you might be entitled to slightly more in financial support depending on where you are. Before you panic, check Track – you may still have an offer. If the university hasn't made a decision yet, phone them to discuss your situation. If neither your firm nor insurance choice has offered you a place, you could decide to apply for a new course through Ucas Clearing – read our full guide to the process. A nice surprise! Do you still want to accept your firm choice or is there a different course you could apply to now with your higher grades? You can do this through Ucas Adjustment. As with Clearing, make sure you do your research on courses and universities properly before deciding to switch – higher entry requirements doesn't necessarily mean a course is a better match for you. Perhaps you want to reconsider your options, build up some more work experience, retake your exams or defer your place for a year? A gap year could offer you some valuable time out to get yourself into a stronger position to apply next year. Results day, done. What happens now? Sort out your accommodation Don't wait around as the best of what's left will get snatched up quickly. Our guide to finding accommodation in Clearing might help. Get your finances in order These include expenses you need to factor into your budget and how to cut your costs at uni. Finally, get a preview of your next few weeks See how Dan spent his last few weeks at home or what Chloe's first week in Edinburgh was like. See what you'll do first in your uni city with our city guides, including nightlife recommendations. If you've gone through Clearing and you're heading to a completely different corner of the country than you were expecting, start brushing up on your new home. Did you not get the grades you wanted for uni? Going through Clearing needn’t be stressful. Hear another student’s successful story.